Yesterday and today I spent time soldering up the various plug-in-panels that will be dispersed around the layout at each of my staff machine locations to enable communication from these point to North Coast Control. I have all but three 3 panels assembled as I don't have enough stereo sockets. While I do have the 6 plugs necessary, those six are currently installed in my headset testbed that was created by Brendan, that I intend to keep for some time. The testbed. On/off switch centre left, master volume control centre, and two headsets plugged in at top left and bottom left. These two headsets have push to talk buttons also connected. There are also two other headsets plugged in, but they don't have their microphones connected up. Yesterday I thought to myself that before I was to add my plug-in-points to the testbed system, I would give the testbed system a final test so that I could confirm if it wasn't working after I connected my stuff to it, it would be 100% my fault. Luckily I did. As I could not get the system to work. It was working, as the Tuesday Nighters had tested it on a number of occasions. Damn! I was checking connections, scratching my head, and thinking. I sent an email to Brendan for some advice. I thought I may have connected the power the wrong way around to the system, and I thought that this may have damaged some components. Brendan responded with some suggestions but I could not get it to work. So today I went over to Jaycar and purchased the components required to replace the 5 capacitors and the one integrated circuit in the amplifier. So this afternoon I replaced these and tested it again. Still it did not work at first. I checked a couple of capacitors and they were a bit wobbly. My soldering is nowhere near as good as Brendan's. So I hit them again with the iron and I think made the various dodgy components work again and we were away. I gave it a test and now I am happy to progress with adding my plug in points to this basic circuit. I have attached about 14 of the plug-in-points to the layout fascia, but as yet I have only wired up 3 of them together. But they are still to be connected to the testbed. I think I will leave the testbed connected for a while, before I remove the plug-in-points in the testbed and just leave the on/off switch and the amplifier in its current location. One of my plug-in-points next to the staff machine at Fairy Hill. The headset is at the bottom and the microphone connection is on the top with the push to talk button next to the microphone connection. In the background is the signal cabin at Fairy Hill. On the other side of the tracks is the plug-in-point for the other side of the basboard also for Fairy Hill. I also thought I might show you last weeks birthday present up on the wall. This was put up on Monday this week. The TV in the shed. I can also connect up my Computer to it, so I might split the screen up and show a fast clock, train timetable graphs or various messages during a running session. Next week I will try and connect the first plug-in-point to the testbed. I think my running session will be a few weeks off yet. This last weekend has seen 2011 Pine Rivers Model Train and Hobby Exhibition held. There were some new layouts in attendance, as well as some old favourites. Well the numbers through the door have been great. The layouts and other displays were great. The shops available were great. The food was great. The atmosphere was great. We all had a great time. No pictures tonight as I'm stuffed. I'll get around to it tomorrow or Wednesday at the latest, as Tuesday is Tuesday nighters. Yes, the package that the boss missed yesterday was from Ron - or Werris to those in the know. After dropping the kids at school this morning, she who must be obeyed (SWMBO for short) swung by the post office after 9:00am to collect the package. I was home with the Solar Panel installers. The wife came to the front door and she had a large package in her hand, so I knew it was the Eureka delivery. I quickly opened it up and it was of the same box style as the 620/720 and Garratts. I took the model out of the green box and then proceeded to RTFM. And yes it was a fancy manual. Although one thing I don't like is a lack of a complete CV list (yes I can download the QSI manual) and particular details about the loco - a sort of fact sheet as you will. I went down to the shed and put it on the track and gave it a run up and down the area around Kyogle, as this is at eye level. I love the sound provided, the idle, the revs, the horn and the brake squeal. It ran very smoothly and went over point work well. My set was #3 with trailer #51 and I had them weathered. The weathering is very subtle and I like it. The interior lights are very yellow though, but I don't know if this is prototypical or not. Being a Canetoad I've never travelled on a CPH. F12 turns off the cab lights in the CPH. Not sure what does the trailer yet. There are two switches under the CPH and one under the trailer. I must admit I have not read what they are for yet. I've packed the set back up to take it across to our exhibition tomorrow, so it can hopefully get a run on Geoff's Splitters Swamp Creek layout throughout the day. Anyone wanting to see and hear it run has to get past me on the door and pay admission. I might have to raise the door prices considering there is sound CPH on show inside. I do like the sound of the horn, and like it as it revs up before taking off. When the headlights are off, all marker lights on the CPH are red. As soon as you turn on the headlight, the marker lights are directional, white at the front and red on the rear for the direction of travel selected. The trailer only has lights at one en, but they are directional. F9 works the same as on the Garratt with the heavy haul feature. This gives a short toot to turn it on and 2 toots to turn it off. The toots are a nice sound. I feel the multi year wait was worth it. It must have been hard for Ron dealing with those drongos at the old factory, but they did produce some good stuff. Thanks Ron. I got home from work today and lying on the bed was a large box. Upon upon closer examination it was a 32" LCD HD Colour TV with dual HDMI input, a VGA input, dual Component inputs and it even records/timeshifts to external hard drives - all this just for the Shed. It is my birthday on Monday, so I received my birthday present early. Although the note on top of the box says the TV also covered Father Day and Christmas. The Boss did advise that she was good at spending my money. So guess who is off to Bunnings tomorrow to purchase a wall mount kit and put it up in the Shed tomorrow afternoon? On another note, I have a slip to collect a package from the post office tomorrow morning after 9:00am. Could it be my sound CPH which Ron advised on Tuesday that was to go out in Wednesday's post? If it is the CPH there will be a post tomorrow night. Saturday this week I went over to the Club for our usual meeting day. I had intentions of putting two of my 44 Class locos with Tsunami Alco 251 V12 sound chips in them onto the Club test track which is fitted with a SPROG II with Decoder Pro on the attached Computer. PK was kind enough to show me how it worked, and I still stuffed it up, but I eventually had two 44 Class locos running with momentum, and a working brake function on Function key 7. Just brilliant! I did have some issues, when I run multiple locos (44's) in a consist (Advanced style) and the brake function only works on the loco we are controlling and not both that are in the consist. That is not a good thing when the rear loco is still pushing to its heart's content when the front one is stopped. I assume that is because I have not set up what function the locos can receive while in a consist. I will look at that at a later point in time. I think I may still need to increase the brake rate so the loco stops a bit sooner. It's a pitty that there were not two break buttons, one for smaller trains and one for longer trains, so you really have to drive your locos around the layout. I particularly like the brake squeal and the air let off as well. I spent some time in the shed this afternoon and ran a test up and down the track around Lismore with the two locos with and without the brake function being used to stop the locos. That is going to cause some of my drivers a bit of a headache at the nexst running day, if I don't tell then which locos need the brake to make them stop. I have another four 44 class locos with sound, 2 with the cheap DSD100's (but with a GM donk) and 2 DSD101's with an Alco motor. I don't think these decoders support the break function. I will try and keep the two good Alco's separate from the other sound locos. I have a couple of days off work this week so I will start the installation of the headphone system around the layout. Just 23 plug in points to install and I'd guess about 70 meters or wire for the various peninsulars. This coming weekend our Club will be holding its annual model railway exhibition at the Strathpine Community Centre (off Melklam Street) in the outer northern suburbs of Brisbane - actually its in the next council district - Moreton Bay Regional Council. Two (or maybe three) other Bloggers will be in attendance. Geoff with have Splitters Swamp Creek there and will be assisted by Darren and maybe Brendan. I'll be sitting on the door for most of the weekend, handing out programs, so just say high when you walk past. I'm also counting down the days until two 73 class locos show up as well as my sound equipped CPH. I hope to have some photos of the various layouts from our exhibition for next weekend's update. On Friday night this week, after doing some reading homework for the youngest and putting him to bed, I started modifying two of my phone handsets so they can be used in my phone system. I tested these, and my already existing one with three jumper wires with alligator clips on each end and a 9 volt battery. Success! All three worked. On Saturday afternoon, I took the phones down to the shed and enlisted the help of Kyle to test them. Nothing - Bugger. I then tried to trace the wiring on my circuit. I knew that 6 of the wires on the 8 core Cat-5 cable were working correctly as my calling system from each end of the phone link was working. So upon investigation, it was revealed that there was no power connected to the phone circuit. That might make it just a tad difficult to send a few sound waves encoded on the wires from one end to the other. This lack of power might also mean wgy when I previously tested one phone in the shed it did not work - funny that. So I studied my circuit schematic and worked out what I needed to jumper together and tested it again. There was one slight crackle and that was it. I then assumed that the 3V power source was not enough to power the system. I did not want to replace my 3V voltage source with a higher voltage because that would cause havoc with my LED's on the calling circuits, as I'd have to install some resistors - that was far too difficult. So I decided to just add a 9V battery to run the phone circuit. Keep them seperate. So I added that and tested again. This time, I enlisted my daughter's help and to our amazement - the phones worked in the Shed. So we have phones now between North Coast Control and Grafton Yard / Acacia Ridge Yard. With that major milestone out of the way work then turned to the wagon card boxes I need for the layout. Where ever a goods train will leave wagons unattended in a siding, I will install a box to allow the driver to drop off wagon cards for the wagons being dropped off in the various sidings. The cards will be picked back up again when a train picks up those wagons. 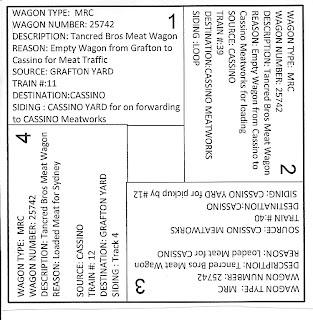 My wagons cards are printed on one side and contain up to four movements to be undertaken. Most only have two movements, but they can contain four movements. The cards are rotated anti-clockwise after a successful movement. I used Microsoft Visio as this is the only product that I knew allowed me to rotate the text in a box in the four directions that I needed. Others might know of other products that can accomplish this like MS Publisher but I don't have a copy of this product. 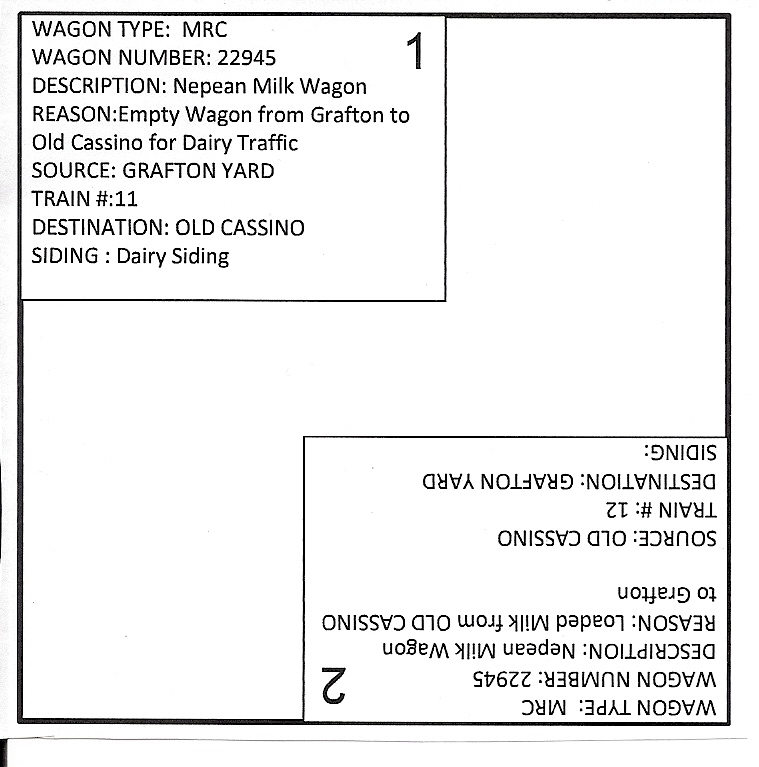 Sample card for wagon number25742 - an MRC wagon. It travels on 4 different trains - #11, #39, #40 and #12. It says where to drop the wagon at each location. Another card for a different MRC, this time #22945. It travels on the same train, but goes to Old Cassino. This card is for an MBC #25757. It travels all the way to Murwillumbah and back. I do 6 cards to an A4 page. They get printed out and then cut up. The cards for a train are kept together by a paper clip. They are collected after the driver picks up his train timetable from the timetable box. A Sample Train Timetable. 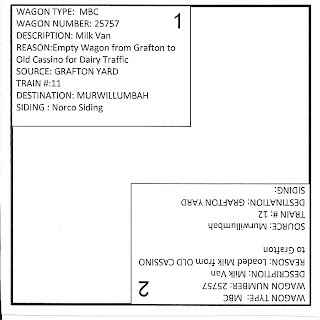 This one is for #10, that runs from Murwillumbah, and picks up NLBX's at Murwillumbah, Lismore and Old Cassino before reaching Grafton Yard. The indented loops are not passing loops but sidings. There is no safeworking to perform when passing a siding on the main. However a train can be locked away in a siding as there is an intermediate staff instrument at each siding. This train is quite a slow runner with NL4 overtaking it at Old Cassino. What information am I missing off the cards? What inform don't I need on the cards? 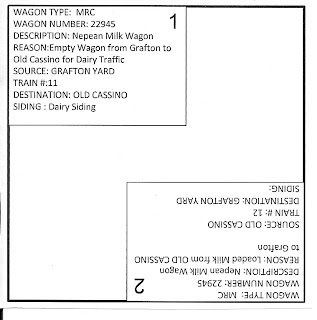 I'm happy to hear from others using wagon cards. 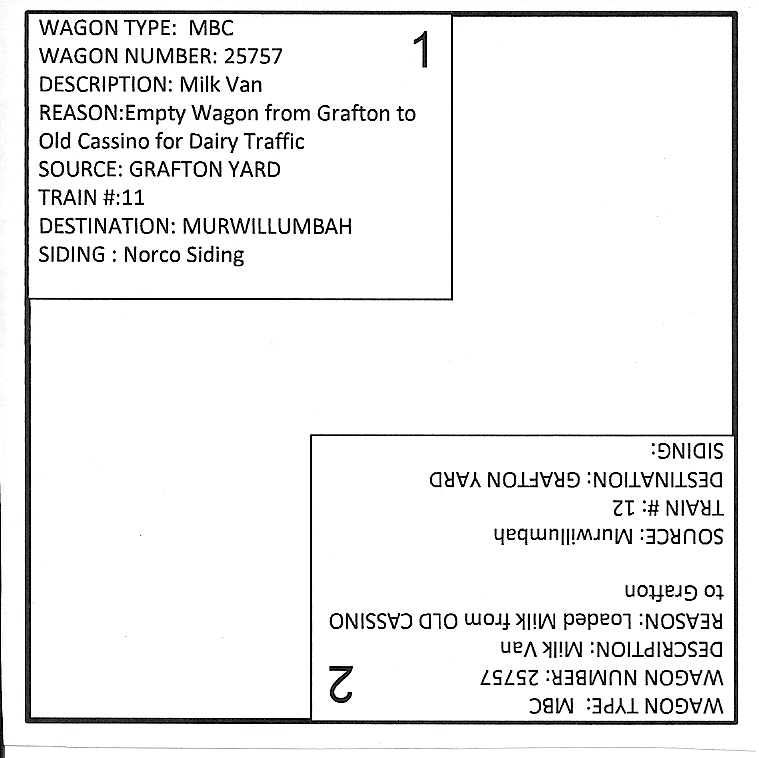 For my block trains that run from Grafton to Acacia Ridge and back, they don't have wagons cards. Last weekend I started cutting up the wood required for 6 wagon card boxes. Today I sanded this, and then assembled the boxes which will fit on the layout facia. These were attached and then upon doing a quick audit, worked out that I needed some more. So I quickly put another 4 together, cutting out, cleaning them up and then gluing and fixing to the facia. Then I realised that I still needed at least another two. I wish I could count properly sometimes. So I cut another two out and assembled and installed then today. The cards are held on his train board by a bulldog clip. The train board comes with a pen, blank paper on the rear to write notes or suggestions for improvements, etc. 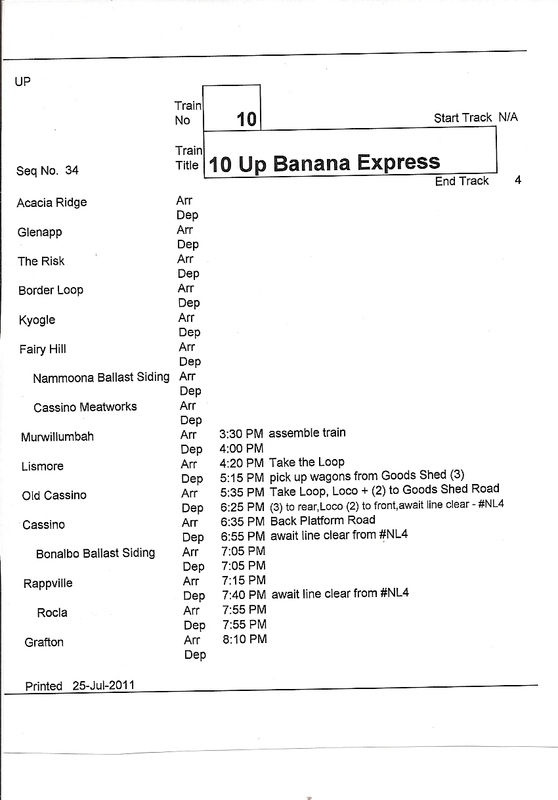 These are collated at the end of each running session, along with the notes made by North Coast Control about where trains actually crossed or where issues were encountered. The Train Board with a timetable, the wagon cards and a pen. On the rear is a blank piece of paper to make notes. 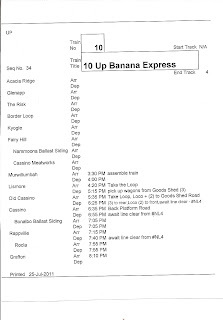 Notes and annotations can be made on the timetable to assist the driver with his duties as well. 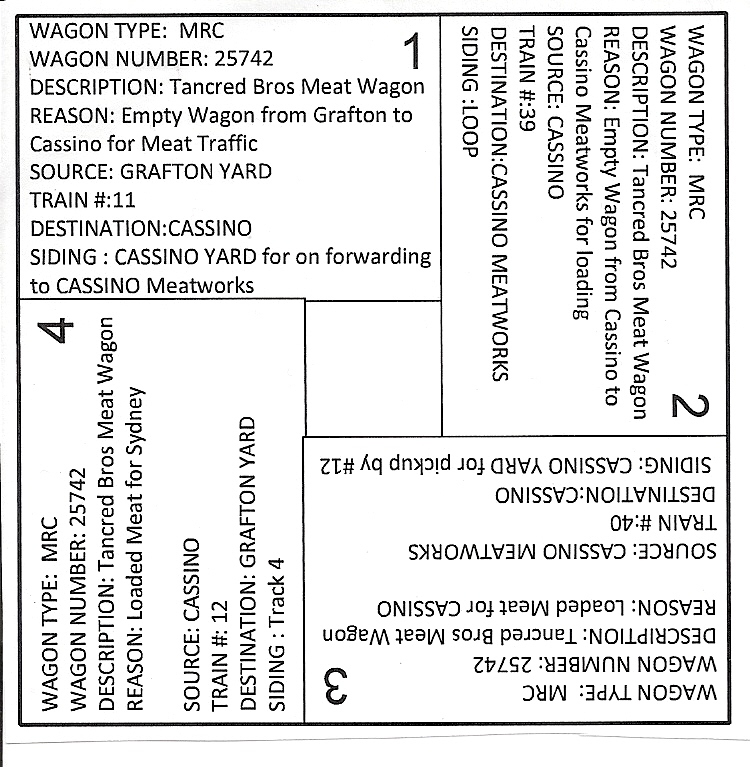 I still need to make up quite a few more wagon cards for quite a lot of the trains. But that is a task for another time. Tuesday Nighters this week - Whoo Hoo!